More Fall Release Shares from Impression Obsession Stamps! I had an absolute "ball".. get it.......BALL.....lol colouring up these Christmas Balls. Such a pretty image and I love that the sentiment is part of the image. Saves me having to get too creative after spending all that time colouring~~~ I did add a little border using the Border DUO 3 set. The main image is called Ornaments. I added some glitter here and there to glitz it up, 'cause you know me; I like it Blingy! 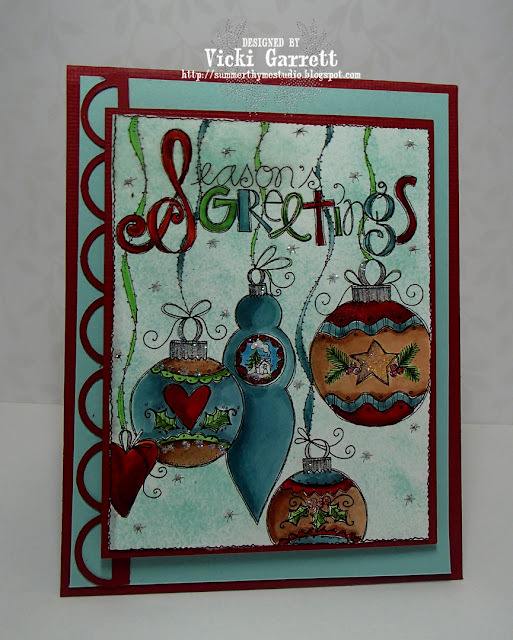 This week over at Stampotique Designer Challenge, Kim is the Hostess! She is letting you have your creative licence with an "anything goes" challenge. I decided to make something sweet and simple. Non descript really, yet elegant I think. It is actually a touch prettier in person as the glitter glimmers and shimmers and I didn't capture the pure whiteness of the cardstock. 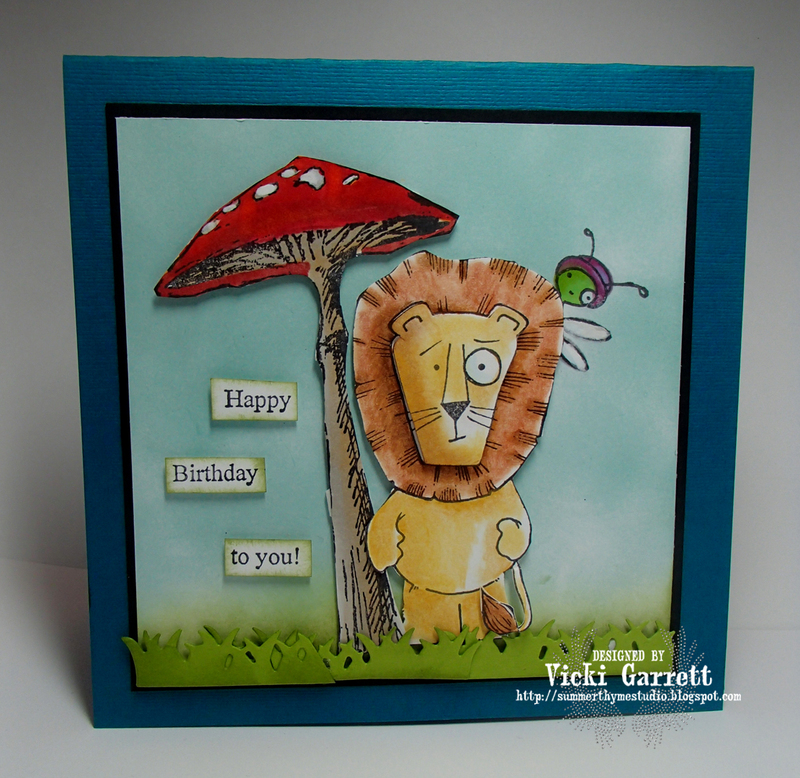 I wanted to thank Carol and Kim for having me as Guest Designer over at Stampotique this month! 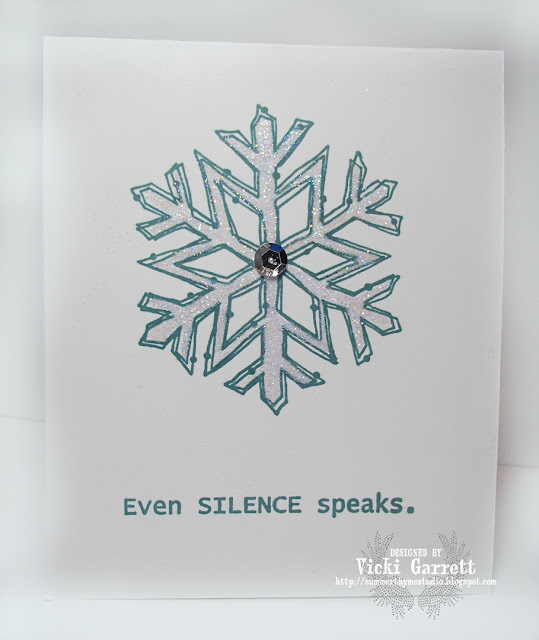 Also, did you KNOW there is a new release Blog Hop Happening over at Stampotique? Hello! Hope you are all doing well out in Blog land Today. I WISH I was in Blog Land too, because it would be COOL there! We've had no air conditioning there this summer and it's like breathing through a little straw.... a teensy, tiny little straw.....NOT the one's that come with the Dollar Drinks (Oh my SWEET addiction!) Anyhoo, our challenge for this week is to have your creation's main focus be the Sentiment, thus SAY IT BIG...... Say it loud, say it clear.......I'm about to burst out into song. Do you remember that one? Even better, do you remember who sang it? So onto the Card Biz! 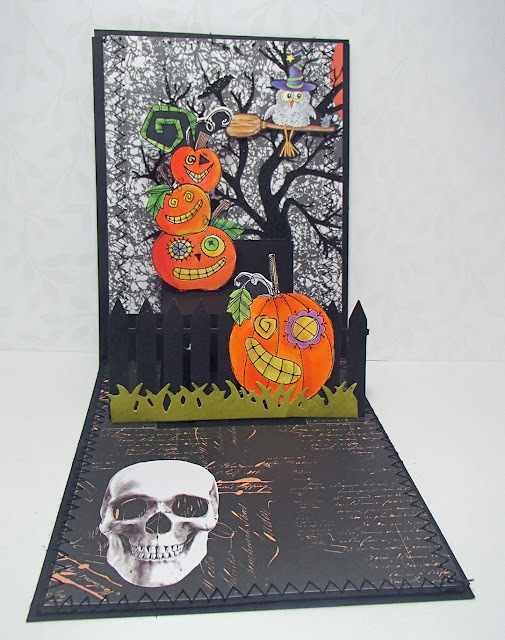 For my Creepy Halloweenie card I started by creating a background with this super fun CAC stamp called Hand Carved Halloween. It's super fun and has quite a retro look to it, don't you think? And now for the sentiment Spooktacular Halloween. I added some colour to the image to make it pop off the yellow paper. Lastly I dressed it up a bit with dies from the Spider Web Die Set and the Halloween Set (bat). I then added a touch of Flocking to the Spider to make him fuzzy and increase the creep factor AND some Glitta on the Bat wings and Spider Web; just because I could! Ha! This is a pretty subtle card, however the main focus is again on the sentiment. Please forgive me if I've shared this one! In fact, just humour me please, recognizing it's my 50 year old brain at work. Lord knows in 20 years when I'm sharing, you are apt to see the same card several times per month! That would be crafters repeat. But then I will be a little elderly and hopefully my readers will respect this elder! lol. Anyway, I simply used two dies and some dollar store pearls to complete this beauty! I have a huge fondness for the stamps and the Company as it was one of the first Design Teams that I was on! I thank Carol and Jim for allowing me to showcase their beautiful stamps! I made the Balloons with my one inch circle punch, sponging the edges for dimension. 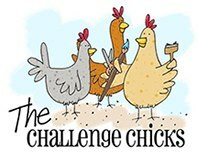 I took a little Hiatus from Challenge Chicks, but I'm back on track, in the pack! This month, the challenge is circles of friendship. 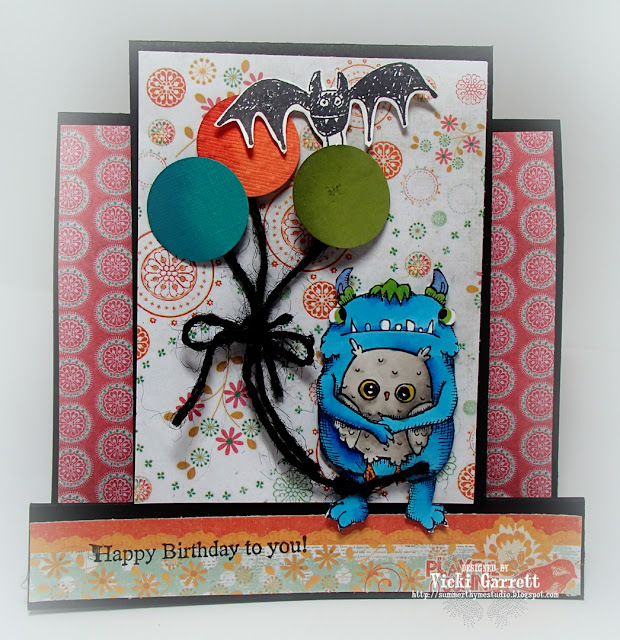 You can make a card with a circle theme, a friendship card...whatever matches the theme! We have an AMAZINGLY talented line up of Creative Ladies to share their take on the challenge today! 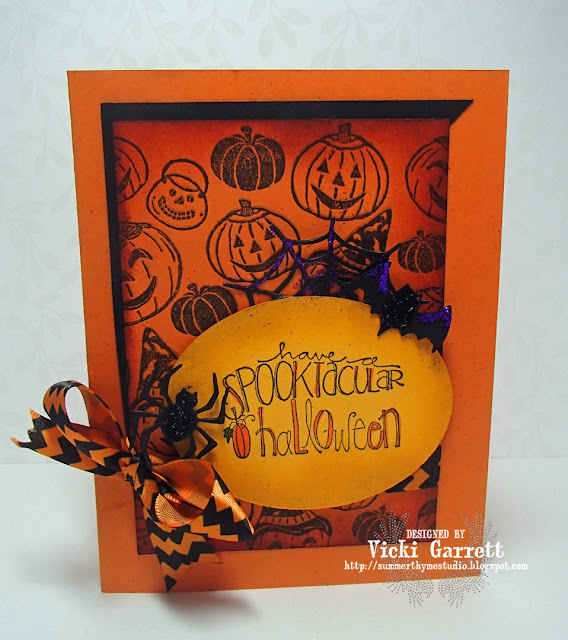 Make sure to post your creations HERE on the Challenge Chicks Facebook Page! 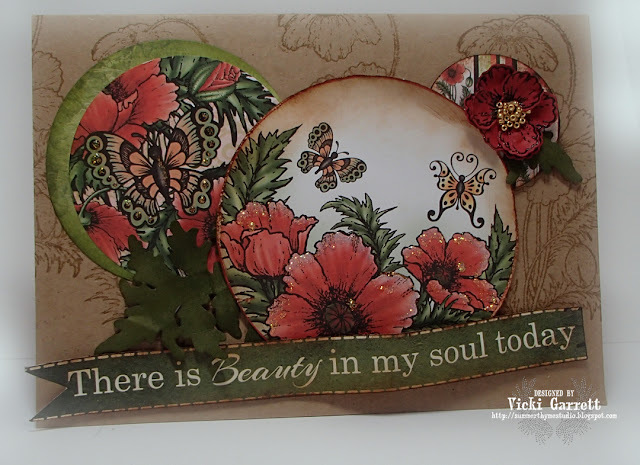 Impression Obsession Designer Challenge-Fall Colours! When I think Autumn, I think Orange, Deep Reds and Yellow of Course.....the Beautiful colours of the leaves as they make their transition from the Trees, back to the earth. Add some Purple and Black and Viola! Halloween! I had so much fun (No, really I DID!) 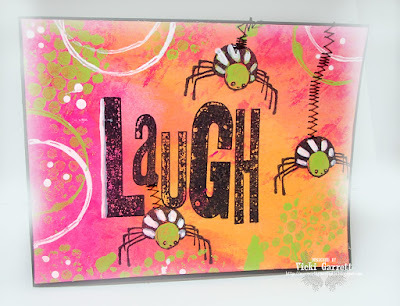 creating this pop up card with multiple images. 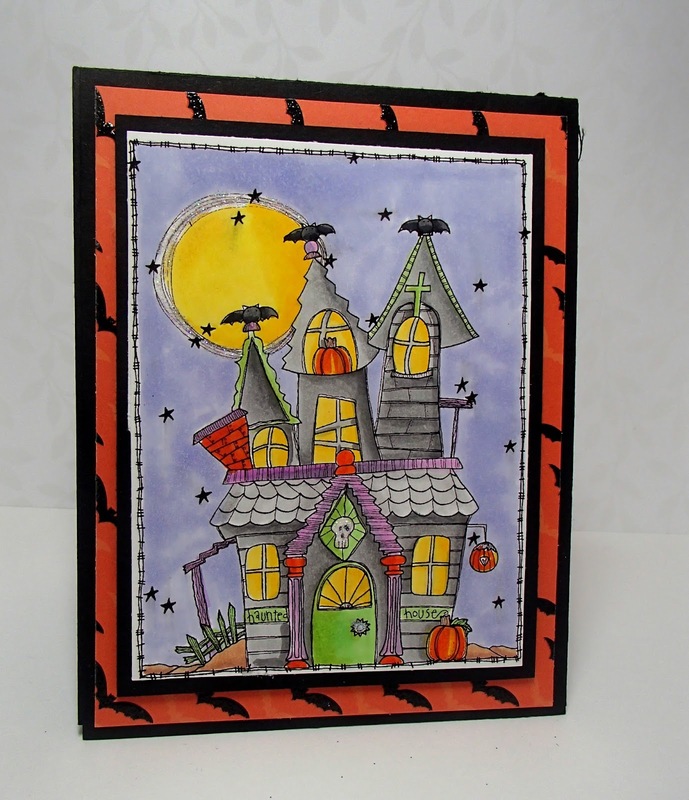 The Haunted House was absolutely perfect for the card front! Now this is where the fun came in! Doing the cuts on the card base, colouring all the fun fun images and sewing a border!!!! Here's what I used on the inside! SDC207 It's a Photo Bomb! Claudine Criner is our hostess this week: We all know those crazy animals or people who make funny faces behind or in front of us while we are taking a photo or those who like to take photos of themselves. Well this challenge is all about that. I want to see those funny photo bomb projects or your best selfie. Hope you will play along in the challenge! It's really never too early to get started on Christmas Cards! In fact, it's really quite nice to have them out of the way, isn't it? I hate to say this while enjoying some balmy weather, but Christmas might be on us before we know it, so why not be ready! In both cases I stamped in Versamark added Gold embossing powder and heated. In the first card, I used shades of Coral with my Copics to colour. I added a little stickle dew drops. No great reason, just because I could! 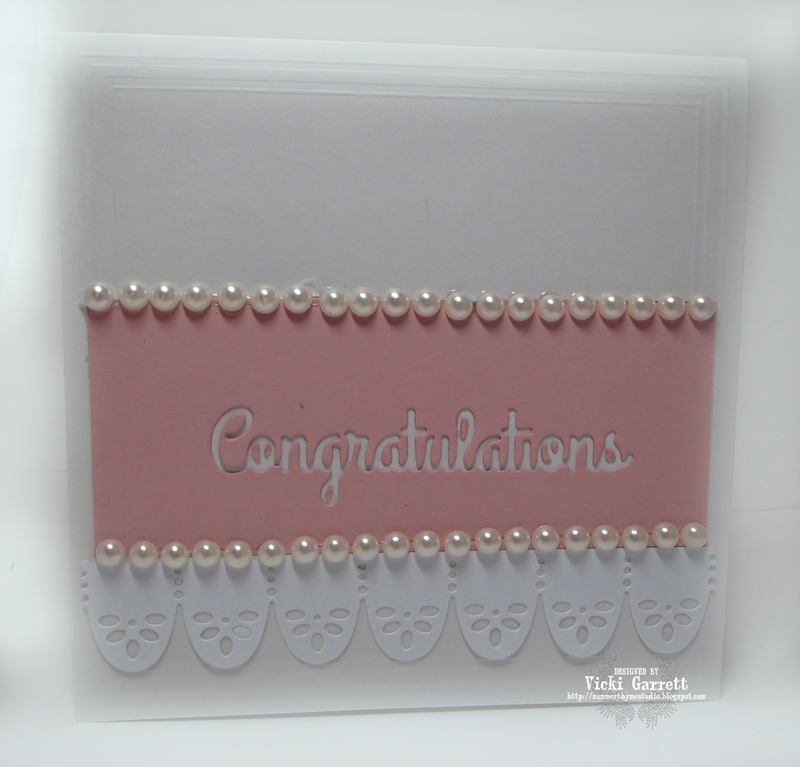 I wanted to create a soft shabby chic card in this one, so I embossed the image in gold over neutral paper. 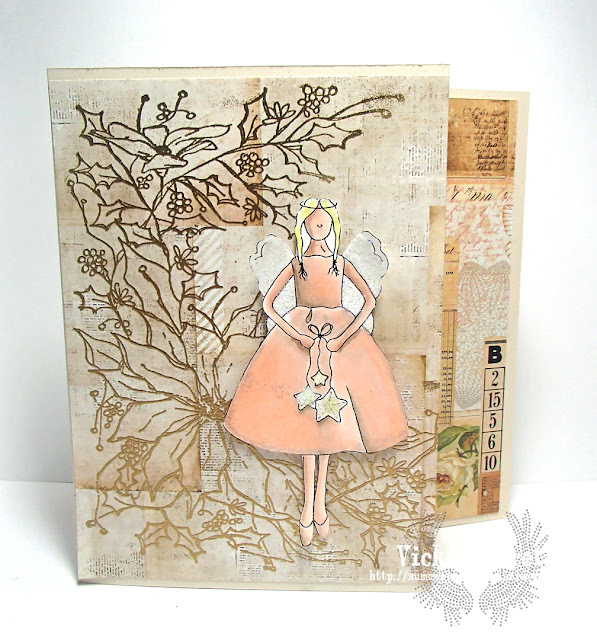 I coloured the Sugar Plum Angel in Flesh and peach tones to keep her subtle. I think it turned out an unusual, yet pretty card! 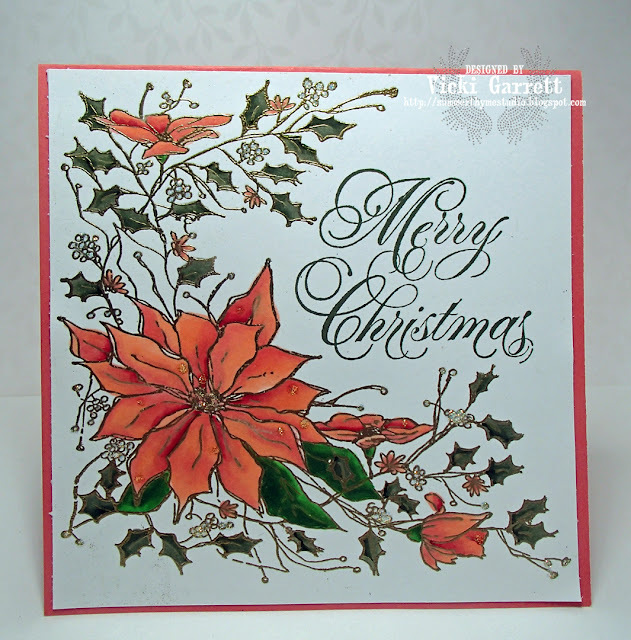 I believe the Poinsettia sketch stamp is a great staple stamp to have around for christmas card creating! 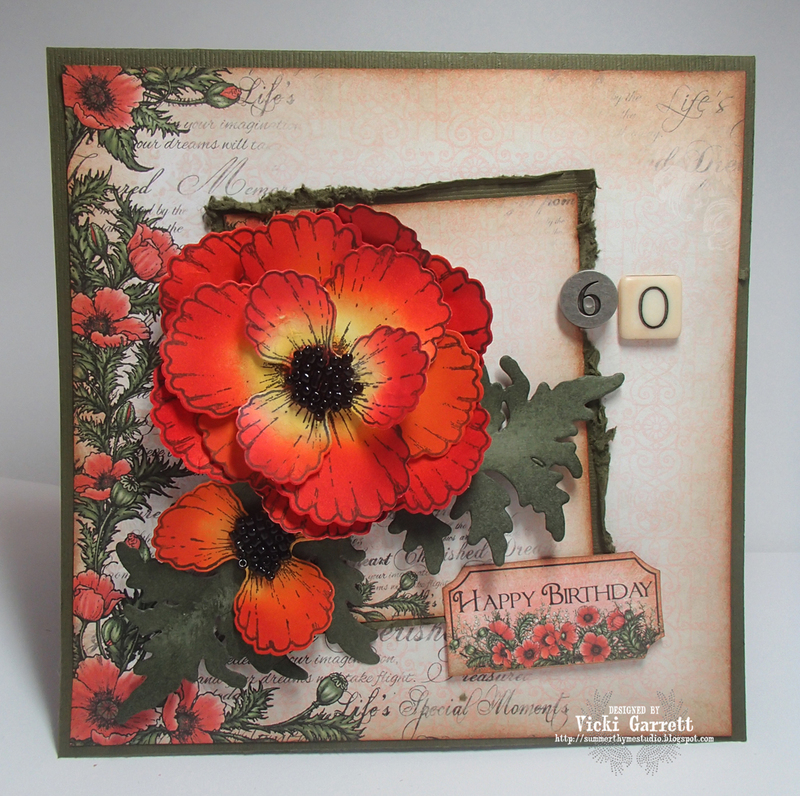 I had some time to finally play with my Heartfelt Creations Poppy Dies! So much fun! My Mother had requested a card for her friend, so I cracked open the shiny new packages and paper pad and went to work! I sponged yellow, orange and red onto the poppy flowers and a little avocado ink onto the leaves to give them additional dimension. I then shaped the flowers and added some seed beads to the middles using my Fabri Tac Glue! The Coordination Paper Pad has some great papers that make your projects all that much simpler to design!